Day 284 – And In This Corner. . .
As we opened tonight’s blog wine, the sounds from the theme to the movie, ‘Rocky’ came out loud and clear. . .and then the visual. . .Rocky running up the steps at City Hall in Philly…punching meat carcasses in the cooler…in the ring against Apollo Creed! Ah, yes, nothing like a wine to bring back memories of a movie with so many sequels, we’re not sure if they’ve stopped making them! When it came out in 1976, nobody expected this low-budget, no-name movie to do anything at the box office, but never underestimate a good story, decent acting and great music to thwart the critics and set a career on fire. Prior to Rocky, Sylvester Stallone was just another bit actor–amazingly, this picture catapulted him to legendary status. And, regardless of whether or not you think he can act, his films have generated hundreds of millions of dollars, but it all happened because a kid named Rocky Balboa had a dream of being the Champ. Then there was the first Ali – Spinks match in February 1978. . .an improbable pairing of ‘The Champ’ against former Olympic Gold Medalist, Leon Spinks. The match has been called one of the greatest upsets in boxing history, but was a short-lived victory as the two squared off in an un-authorized rematch in September of the same year and Ali walked away the winner in a 15-round unanimous decision. Whether it’s bare knuckle boxing or gloved box or today’s UFC fights, heavyweight champs are still in demand. This 2010 Heavyweight Petite Sirah from California came out swinging, but ran out of gas before the first round was over. A decent wine for the price–around $10 a bottle–dark purple in color; a nice nose with hints of oak and tobacco, it just doesn’t finish strong. 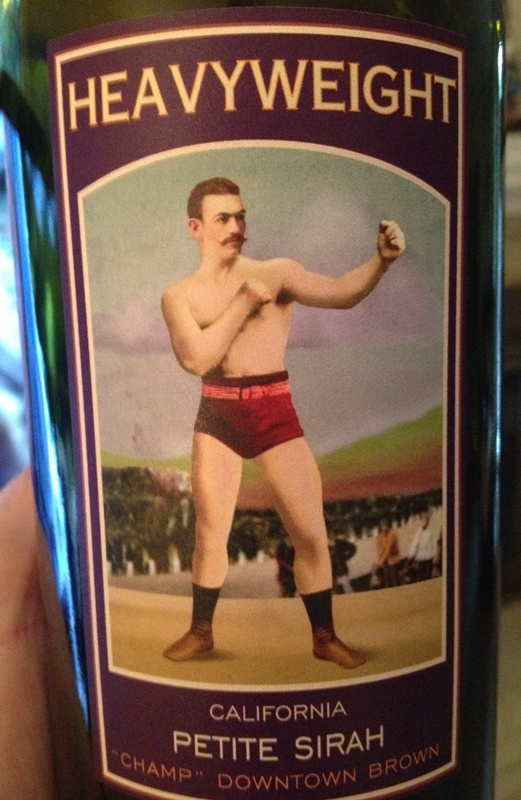 Jean commented that it’s almost an oxymoron…heavyweight petite sirah! At the end of the day, that’s probably what it is…an oxymoron of a wine. The name suggests big, bold and powerful, but the taste doesn’t enough punch. While the central coast of California is ideally suited for wines just like this with varied growing micro-climates and access to large numbers of fruit sources, we had hoped that this wine would be one of those ‘sneaky-good’ wines that we found at Central Market in South Austin. Yep, wine guy Andy Christiansen who was previously at the Central Market North is now running the show down south and was undoubtedly, cleaning out the closet with some of these wines! We’ll continue to watch him get the wine shop there in tip-top shape. Not everyone was a fan of the ‘Rocky’ movies, but those of us who saw the first two or three still love the boxing scenes the best–especially when Rocky’s head moves before the punch arrives. . .but hey, this was before all the sophisticated special effects that are in movies today. Back then, there were no computer animators to make it look real–they actually had to go into the ring and box. It’s like making wine; you can’t use special effects to make great wine. You have to get in the ring and make it the old fashioned way–over time. We hope that as your week reaches the middle tomorrow that you have a great day and we look forward to trying yet another variety for discussion tomorrow. Categories: Uncategorized | Tags: Adrianne, Heavyweight Petite Sirah, Rocky, Syvester Stalone | Permalink.